Important: In order to draw a new object in the rayCloud, at least step 1. Initial Processing has to be completed. Warning: Drawing surfaces has an impact on the 3D Textured Mesh and step 3. DSM, Orthomosaic and Index, if the 3D Textured Mesh and/or step 3 are processed after the surfaces have been created and if the Use for DSM and Triangle Mesh box is selected in the right sidebar of the surface. 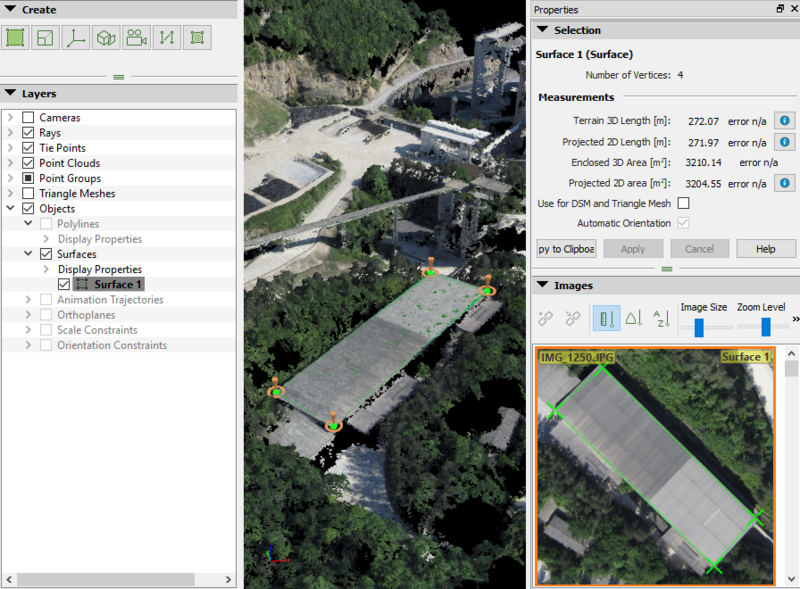 How to correct building artifacts in the DSM and Orthomosaic with the rayCloud: How to correct Building Artifacts in the DSM and Orthomosaic with the rayCloud. How to improve the 3D Textured Mesh: How to improve the 3D textured mesh. 2. 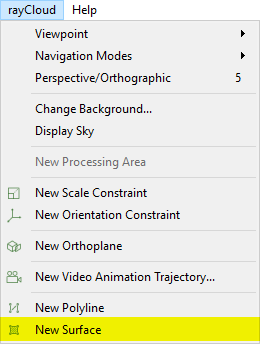 On the Menu bar, click rayCloud > New Surface. 3. On the 3D View, a green point appears beside the mouse. Left click to mark the vertices of the surface. At each click a vertex is created and the surface is formed. When drawing the surface, a vertex used by other objects can be reused for the new surface by clicking on it while drawing the surface. 4. Right click to add the last vertex and create the surface. Note: When the surface is created, next to the measurements "error n/a " appears, indicating that the measurement accuracy cannot be calculated till all the vertices of the surface are marked on at least 2 images. 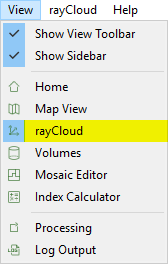 For step by step instructions: How to edit Objects in the rayCloud. 5. (optional) To complete the drawing adding higher accuracy to the surface, on the 3D View, select the surface and correct the position of the vertices: How to edit Objects in the rayCloud. Note: A Manual Tie Point is associated to each vertices of the surface. Each vertex that is marked on at least two images is taken into account in step 1. Initial Processing if it is processed again or if the reconstruction is reoptimized.